We've been quite busy the last few weeks with only a small breather this week. December is a full family month with everyone coming to visit for the holidays. Last week we had an action packed week of touring the island and showing family the sights. This upcoming week more family comes and we'll be doing some scuba diving here in Rincón. This past week has also been an exciting time up at the jungle property!! 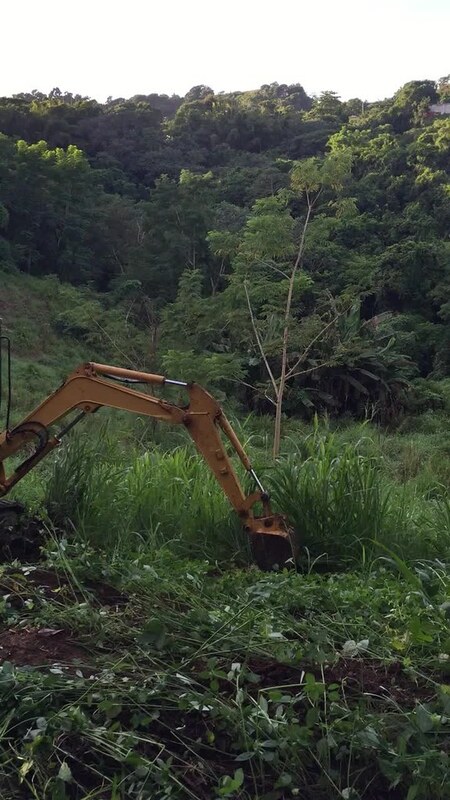 We were able to work with our contractor to have his land clearing guy (technical term) come and move some earth for us! 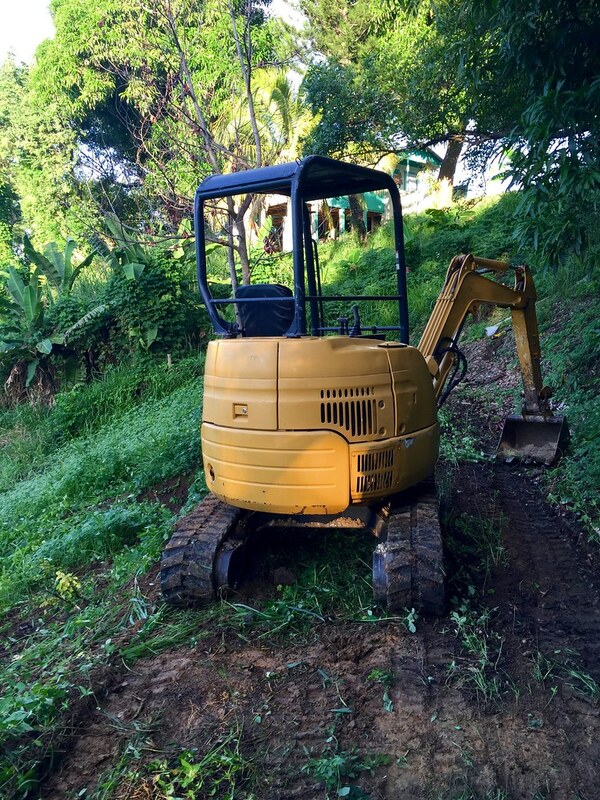 The project was to level a bit of one of our hills to be able to put a small casita on the property. Our property has a flat portion up near the street but this is quite a large area and we'll use that for the main house that we'll build eventually. 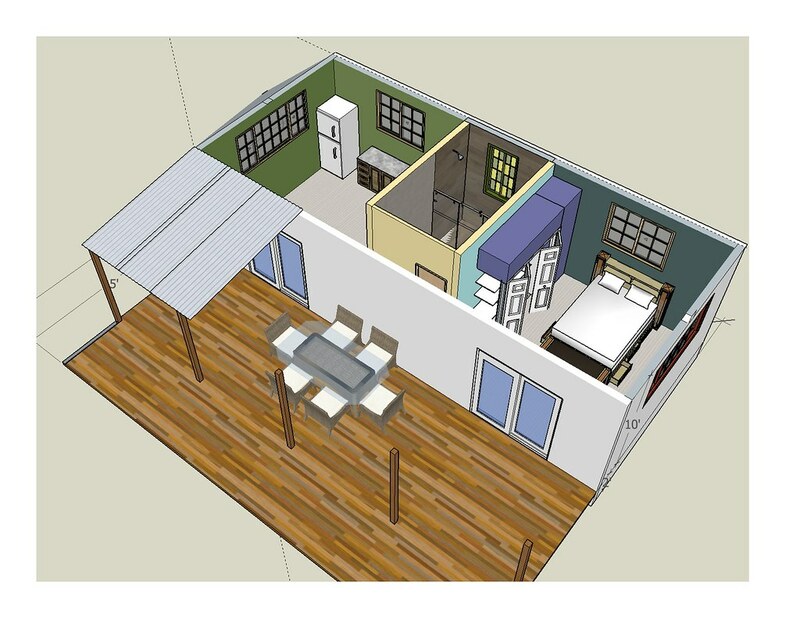 We'll do the casita first so we can move up to the jungle permanently and we're hoping to be able to have it built by the end of 2016. Ultimately the goal is to have the casita as a rental or airbnb once the main house is built. First step for the casita was to get a bit of earth leveled. We were initially going to cut down from the top of the hill so that we'd have a completely flat area about 1000 sqft in size. Once the guys came to do the clearing we all realized the land would need be cut down by about 15ft, so the roof of the cabin would be below the driveway that is behind it. Instead the guys terraced the land so the cabin will only sit 5ft lower than the driveway and the back side of the cabin can be used to retain the area we cut down. Most of the foundation for the cabin will be on the top terrace and then we'll need to do footings and I-beams to support the patio portion. It was amazing how delicately the backhoe operator was able to clear the growth on the land. He cleared in 5 minutes what it took us 3 weekends to do! 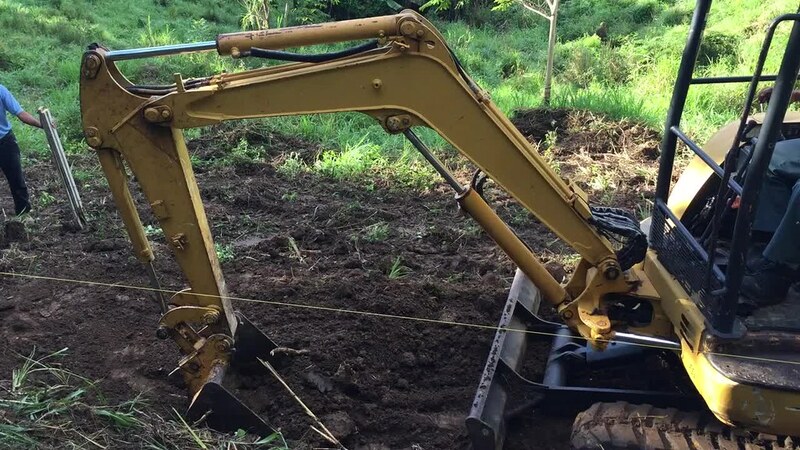 Once he had the grasses cleared out he was able to move the dirt, compact it with the treads of his backhoe and then use the claw to crawl up and down the rest of the hillside. It was also amazing to see how quickly things grow here. We had this whole area completely cleared a few weeks ago and it almost looks like we hadn't been there in over a month with the amount of new growth that's already come in! The horses are gone now so it's on us to keep the pica pica at bay!! I never knew how excited I be to see dirt being moved but it was pretty enjoyable to watch! Our next step is getting the plans from the structural engineer so we can get our utility applications in and power and water run. We also need to have the backhoe come and carve out another end to the driveway so we can access it from both sides of the property. Very exciting month here in Rincón! We probably won't have much done on the property for the rest of the year but we're looking forward to spending the holidays in the tropics with family and sharing our new lives here with everyone!